Not only is this a nostalgic way to lather - it's the better way. Unlike shave gels and foams which last approximately a month, our 3 oz bar of Saving Soap lasts upwards to a year. Our gentle Shave Soap, perfect for sensitive skin, is paired with our Hand turned Beechwood Shaving Brush. A great way to shave...naturally! 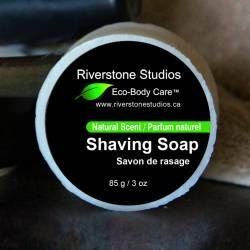 Riverstone Naturals Shaving Soap gives you clean shave with lots of lather! Made with Olive, Coconut, and Palm Oils, it is gentle on the skin and moisturises while you shave. Perfect for sensitive, normal and dry skin, Shaving Soap is fragrance-free, scent-free, and chemical-free leaving you with soft, smooth skin without irritation. * We at Riverstone Studios are committed to purchasing only Palm Oil that is only from a Certified Sustainable source, which must meet strict standards to ensure it is being produced in a way that is healthy to the environment. Beautiful shave brush made from hand turned Beechwood and soft nylon bristled knot for many years of use. The bristles are as soft as badger hair and last longer. In fact - 10 out of 10 badgers prefer you to use our brushes over natural hair bristles. The knot produces an excellent lather when used with our moisturizing Shaving Soap. Ideal for both men and women.